"You know, Abe Lincoln, when asked how long a man’s leg should be, said: 'Long enough to reach the ground.' Well, these titles needed longer legs than most." Bass' titles for It’s a Mad Mad Mad Mad World come in at just over four minutes – his longest sequence, second only to West Side Story in 1961. He directed it in 1963, the same year that he designed the iconic poster for Hitchcock's The Birds. Mad World is a frenetic, exhausting film, and Bass reflects this in his sequence, featuring a crudely-drawn globe subjected to an endless barrage of visual puns and sight gags, courtesy of its inhabitants. Propelled by Ernest Gold's carnival-themed score and boiled down to a thick palette of black, white, and saturated hues, Bass employs a simplistic, childlike illustration style, contrasted sharply by the heavy lines and formal typesetting of the title cards themselves. 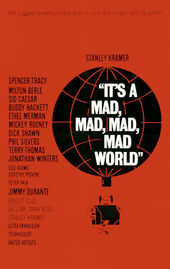 Unlike many of Bass' previous sequences, Mad World does not have an allegorical link to the film itself. Instead, it sets the tone of the film through color, tone, and character – essentially, it's a primer for director Stanley Kramer's lighthearted tryst through the universal language of greed and deception. Bass' oversimplified sight gags downplay the film's dramatic overtones, mirroring Kramer's treatment of the film itself. The animation techniques used by Bass in Mad World were heavily influenced by a new movement in the cartoon industry that favored a modern, stylized aesthetic over the then-dominant school of Disney hyper-realism. He also took advantage of a new animation technique called 'holding,' which involved splitting characters and environments up into several layers and selectively recycling them during photography. Originally used as a money and time saver at big commercial studios, it was exploited by the new school for its inherent quirkiness, with the fast turnaround as an added bonus. Bass took this one step further, playing his visual 'holds' off Gold's soundtrack, creating a tango between the audio and the visuals that gives the sequence its own distinct pulse. Among the several talented animators who contributed to the sequence was Bill Melendez, an established Disney & Warner Bros. animator who was also Charles Schultz's exclusive go-to on the Peanuts franchise until his passing in 2008. The Mad World titles saw Bass return to his earlier ventures into comedy (The Seven Year Itch, Around the World in Eighty Days) – a genre he enjoyed but had become disassociated with after his name became synonymous with Hitchcock thrillers. It is also his first collaborative project, as his design framework mainly showcased the talents of other established animation artists of the day. But it was ultimately his use of their techniques within his design framework that gave Mad World a credible tongue-in-cheek sophistication that may have otherwise been lost in the whirlwind of the film itself.